The Bloodhound is one of the oldest scent hunting breeds. Their name does not refer to scenting blood, but rather to its status as the “blooded hound”, meaning aristocratic. They have been described as a unique looking dog in a baggy suit. This breed has such a distinct ability to discriminate human scent that it is the only breed whose findings can be submitted as evidence in a court of law. Today the Bloodhound is still used for tracking, search and rescue and law enforcement. This breed is so versatile it could be looking for a lost child today, in the show ring tomorrow, and happily lounging on the couch the day after that. Having been recognized by the AKC in 1885, the Bloodhound can range in size from 23 to 27 inches tall at the withers and is a great companion dog when not working. Try to picture a life sized cupcake, approximately 2” high, and 3” wide, with either vanilla or chocolate frosting (we choose frosting flavor)…..and even jimmies! 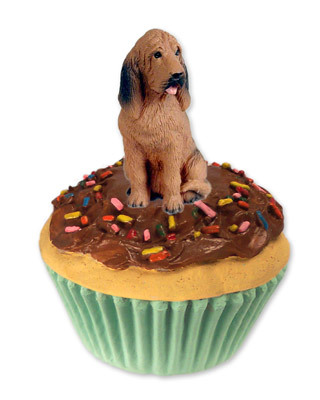 That is exactly what our pupcake trinket boxes are! You pick up the top and the cupcake bottom is the trinket box! They are hand painted and top quality. Every little jimmy is painted a different bright color! If that’s not enough, we then mount one of our Tiny Ones figurines to the cover! This is a totally unique item, made even more special with the addition of your favorite breed on the top! All items are individually blister packaged, ready to give as a gift, or hang in your store. Great item for that special someone for birthdays or any holiday.